Looking for storage in Chula Vista, CA? You’ve certainly come to the right place as Big Box Storage offers portable storage services throughout Chula Vista, California as well as the surrounding San Diego areas. Big Box Storage provides customers with the ability to fulfill their self-storage needs without having to ever leave their home or business. So if you need storage in Chula Vista including zip codes 91910 or 91911 as well as 91913, 91914 and 91915, forget renting a truck and skip load/unloading a truck. Big Box Storage can deliver a storage rental unit (a "Big Box" with dimensions of 8 ft. by 5 ft. by 7 ft.) to any apartment, house, condo or business in the Chula Vista area. Generally speaking, each Big Box storage rental unit can hold up to a room and a half of contents. If you should require additional storage space, multiple “Big Box” storage units can always be delivered. When you finish loading the storage unit, the company will then pick up the storage unit and return it to their secure, indoor self-storage location in the Chula Vista area. Big Box Storage also provides portable storage across the remainder of South Bay including Imperial Beach as well as Spring Valley. Once the Big Box storage unit is transported back to the company's secure Chula Vista area storage facilities, you will then be able to access it seven days a week. Once you reach the point where storage space is no longer needed, Big Box Storage can then re-deliver the storage unit back to your Chula Vista home or business. Alternatively, if you’re moving long distance from Chula Vista, you may also opt to have the storage unit shipped to your new address in destinations around the country. While the convenience offered by Big Box Storage of Chula Vista, CA is unmatched - so are the company's storage rental rates. Please feel free to check all of the company's great rates here - remember that all rates are backed up by the Big Box Storage 110% low price guarantee. Find a Chula Vista competitor offering a better rate, Big Box Storage will beat it by 10%. 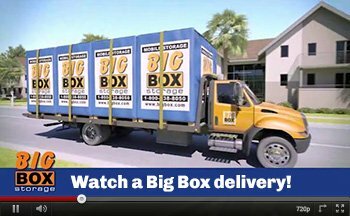 Big Box Storage also provides free delivery and pickup (with a three month minimum storage term) for their storage rental units in Chula Vista. 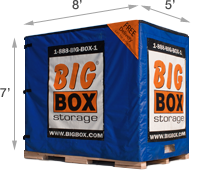 Big Box Storage representatives can be contacted toll-free 619-436-5020.